Jeffrey Berns, who owns the cryptocurrency company Blockchains L.L.C., has bought 68,000 acres of land in Nevada that he hopes to transform into a community based around blockchain technology. His utopian vision, which would be the first ‘smart city’ based on the technology, involves the creation of a new town along the Truckee river, with homes, apartments, schools, and a drone delivery system. Called Innovation Park, the designers contend the city will be ‘human-centric,’ while also planned around autonomous, electric vehicles. Housing types will range from single-family to models of communal living, and office typologies will incorporate both workplace and manufacturing capabilities to encourage innovation. The concept of regenerative design is also at the project’s core, with a strong focus on renewable energy sources such as solar and wind; however, the exorbitant amount of energy bitcoin and blockchain consumes would seem to undermine any sustainability efforts. “We will use blockchain, the public blockchain, where ever possible, ” Mr. Berns said at a launch event for Innovation Park last week. He believes the technology will make it possible for ordinary people to control their own data and keep systems honest, fair and democratic. Residents will be given an Ethereum address, which will be used for storing personal data as well as voting on local measures. Berns has already won over support from local officials as well as Nevada’s governor. 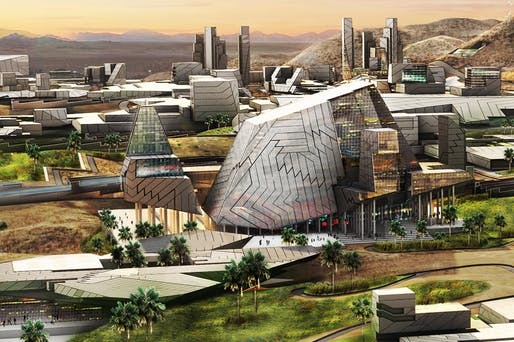 Currently just an office building in the middle of the desert, he expects to begin construction in 2019, at the earliest. Mr. Berns admits that his ambitions are beyond what blockchain technology has currently proved capable of. But, regardless of its success, “it’s going to be one hell of a ride,” he says.